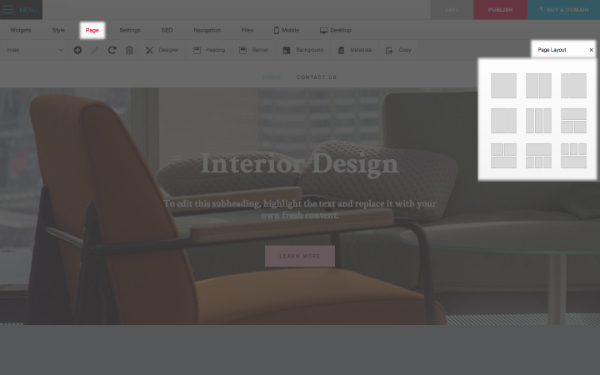 The Sitebuilder allows you to define the layout of your page. There are 9 different options to choose from. You can start with a blank page, or use a preset layout with drop zones to give you greater control over your content. You can use the same layout for your whole site, or a different one on each page. To access the various layouts, please go to Page > Page Layout. Click on the layout you wish to use. This will need to be done for each page added. Please keep in mind that if you select a new layout, you will need to reorganize your content.